Information about East San Jose Pool. 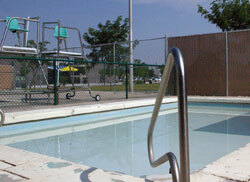 Monday through Friday Noon - 4 p.m.
East San Jose Pool is a 25-yard shallow outdoor pool. We currently don't have a summer aquatic team at East San Jose participating in our city Swimming Metro League. Find out more about aquatic teams.